War Work in Dacorum | The Dacorum Heritage Trust Ltd.
DACHT : BK 8458.3. 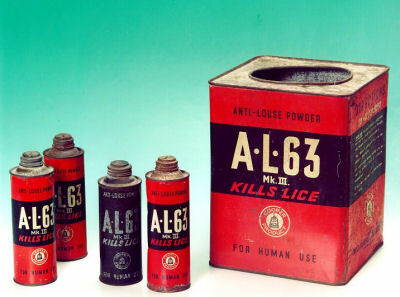 Troops dusted ‘AL63′ into their clothes to ward off lice which could spread diseases such as typhus and diphtheria. Thousands of these tins were found by the Belgian Government in a large hanger in Flanders. DACHT : BK 7007. Durrant’s factory, Berkhamsted, made a variety of wooden products for the war effort. Many companies throughout Dacorum adapted to making special products during the Second World War. Brock’s Fireworks, for example, made signal rockets, parachute flares and Verey lights. Bulstrode Farm, near Kings Langley, grew sunflowers, the seeds of which were used to manufacture edible oils and margarine. Cooper’s sheep dip factory at Berkhamsted developed anti-louse powder during the war. They tested many different formulas – the 63rd was found to be the best – and so it was given the name AL63. 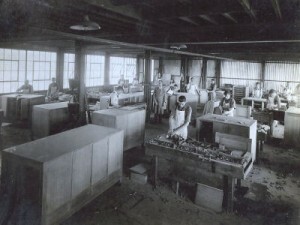 Local men not considered fit for active service, as well as thousands of women, were drafted into these firms in order to fill gaps left by men called into the services. Dacorum also remained an important area for agriculture – producing foodstuffs to sustain the war.